The inspiration for this puzzle was the phrase, "I'm Tired." My son Dan is a new father — he and his wife Emily don't get much sleep, so they're often yawning. (Could be my frequent subject of the crosswords I'm constructing, of course, or other people's grids that blew me away.) Emily and Dan are patient with my chatter, but you know how it is — friends and family are either into crosswords or they're not. But when I realized "I'm Tired" could be a phrase said by cars, it was, ahem, off to the races. That would have been the title if this went to a publication that used them, and the revealer would have been something other than TIRE, such as TREAD. I'd been trying to think of something interesting you could do with circles besides highlighting words. I'd played around with various ways to do eyes — dots, dashes, etc., but they weren't working. Then it struck me it would be a cute theme to have circled letters that look like tires, hence the Os. I usually do tricky, Fireball type puzzles — it was Will who saw this could make an early-week puzzle with a unique twist. He sent back my first crack because it had MERCURYSEVEN — Will wanted all the car makes to be current. LINCOLNLAW matching GERALDFORD also stalled out, but LINCOLNPENNY/ HARRISONFORD finally ran smoothly. I tried various grid designs, making sure to have no bumps in the road (blocks) between the pairs of circled Os. Much appreciation to Joel Fagliano, who was a tremendous help in improving the fill. I'm a retired Biology professor, keeping busy now babysitting my one-year-old granddaughter Adeline, and setting a world record for most novels never published (35 and counting.) Long interested in cryptic crosswords, particularly of the fiendishly difficult British sort, I only recently began constructing American-style grids. I compete each year in ACPT and play in an over-the-hill soccer league on Sundays. Congrats to Paul on his NYT debut! I've seen his name in other venues, so it's great to welcome him into the NYT fold. Circled Os, representing wheels, support a TESLA, FORD, LINCOLN, and a DODGE. I've prettied up the picture below, the same as what we did when this same idea ran a few years ago. It's a shame that Paul got scooped. Very common for two people to come up with the same idea independently, but the previous one sure takes away from the novelty. Nice selection of themers, all of them snazzy. 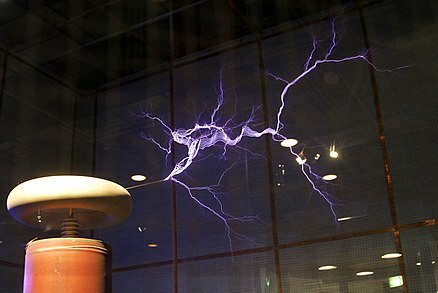 I hadn't realized that a TESLA COIL was a radio transmitter — fun fact to learn. Every themer does a good job disguising the car make, too. Minor nit: I would have liked all four makes to be at the front of their phrase; a little wonky to have FORD be the only one at the end. It's not easy to work in those eight Os in fixed places. I liked how Paul balanced each of the four cars so nicely, each wheel exactly one square away from the end of the car. But it sure created some compromises. Take the west section, for example. It's not easy to work with two long entries atop each other in LINCOLN PENNY and TOESHOE. Add in the fact that there's a pretty big white space to fill above them, and it's not a surprise to get CII (random Roman numeral) and CANIO (such a tough name for a Monday). And check out the lower left. Neat revealer in TIRE — that was necessary to make this a Monday-easy puzzle — but TOR is a heavy price to pay. (I'm an avid rock climber and a regular crossword solver, and TOR is barely familiar to me.) Along with ALOES, an odd plural (made even more so by the presence of INDIGOS and YOOHOOS), it should have been reworked. Admirable to hear how hard Paul worked both on this crossword and on his 35(!) novels! Average word length: 4.74, Scrabble score: 301, Scrabble average: 1.63.